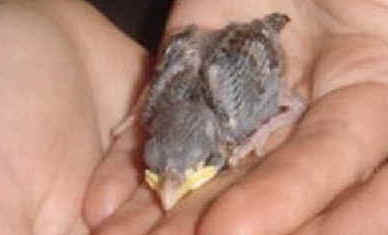 A few weeks ago, we received a phone call from a concerned friend who had found a baby bird, struggling to survive after falling from the nest*. This tiny (but feisty) little fighter was covered with ants and just beginning to get her feathers. Our friend told us that she frequently sees birds that have fallen from their nests around her driveway, but that this baby bird in particular seemed determined to survive. She offered to bring the bird to us, if we would be willing to help. She was barely old enough to open her eyes, and the ants that were covering her from head to toe were literally eating her alive. But once they were all removed, she immediately began to chirp for food. Naturally, we looked online to see what the appropriate food would be, after seeking guidance from vets in the area who helped us figure out what kind of bird she was. As you would expect, different birds have quite different needs, so it really is very important to find out what kind of food is suitable. Note: It is extremely important to do thorough research before attempting to feed a baby bird. Too much food at once can cause the bird to inhale it, and this can be fatal. If you find yourself temporarily taking care of an orphaned bird, be sure to take sufficient time to find out how to care for them properly. There is lots of information available online to help you make the right decisions. In addition, unless your bird is unable to be released into the wild, caring for one in your home should always be a temporary measure while you find an appropriate long-term situation, such as with a licensed rehabilitator. While we took steps toward finding an appropriate situation for Phoenix, her eyes opened more every day, and she became increasingly engaged as she began to observe the world around her. She cuddled up close to the hot water bottle we kept warm for her, and hungrily devoured her food, which visibly turned into new cell growth overnight, as her beautiful feathers began coming in a little bit at a time. It was quite an experience to have the opportunity to see how her different feathers formed. From the fuzzy mohawk she started to sport on her little head, to her wing feather sheaths that looked like miniature bones, gradually revealing their tips like tiny little paintbrushes, then (as if by magic) turning into full feathers as they were released from their sheaths, becoming wings right before our eyes. It was truly a miracle to observe. Before long, it became clear that Phoenix needed to be re-homed as soon as possible, as there were things we could not provide that she needed urgently to have a truly fulfilling life in the long run. 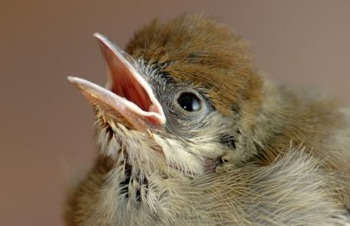 In order to be released into the wild, birds need to be taught how to live like birds as early as possible. They need to learn things like the songs of their species, which grass seeds are edible, and how to avoid becoming prey to other creatures. We were fortunate to find the help of someone who dedicates her life to saving these beautiful beings, and she kindly agreed to take Phoenix in and introduce her to other birds who would help her learn all the things she needed to know. We wish to offer our sincere thanks to our angel Sandy, who lovingly took in little Phoenix, and in whose care she is now thriving. Our heartfelt thanks also go out to Phoenix, a tiny being with a giant will to live. She helped us to learn more about the exquisite beauty all around us, and, through her great need for our kindness, gentleness and patience, she gave us the chance to be of true service to the Power by which she was formed. For that, we will always be grateful. Note: Although Phoenix couldn’t be returned to the nest, many baby birds who appear to be “abandoned” are actually learning to fly or find food. If you find a baby bird that appears to be in good health, but is out of the nest, watch for the mother to return. In some cases you can also return the bird to the nest yourself if needed. 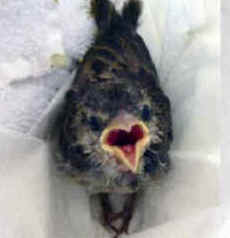 Look up “rescuing baby birds” for more information.